Here's a card that originally came as a commission request. Although nothing came of the request, I still thought this would be a fun card to make, and it was. Apparently Prince, in addition to being a musical virtuoso, could also get down on the hardwood. 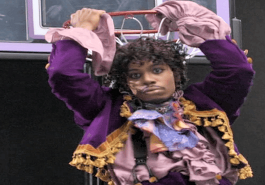 The Charlie Murphy story that spawned the hilarious Dave Chappelle skit about he and his brother Eddie hooping with Prince at Prince's house is said to be all true, right down to the after game blueberry pancakes. The 1972 yearbook picture of Prince on Minneapolis' Bryant Junior High's basketball team originally ran in a 1984 article in the Star Tribune, but went viral in 2015 when the old clipping was unearthed and posted on Twitter. In the article Prince's basketball coach, Richard Robinson, said that Prince was an important part of the team, usually the first or second guy off the bench. He noted him to have a good shot and excellent handles. Even though Prince was only 5'2" Robinson told the Star Tribune he could have started for a different group of players noting the team was loaded with talent. He also said Prince expressed his displeasure with not being a starter frequently. 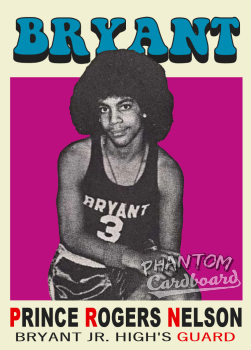 For the card I wanted to go with the 1972-73 Topps basketball design but I saw that after a search with the keywords 'Prince Bryant basketball' that someone had already beat me to it. So, I went with the design from the year prior. The person who did the '72-'73 actually colorized the picture and did a pretty good job at it. I've only dabbled with colorizing a black-and-white photo - with very limited success - so I kept mine newspaper clipping color. I knew the biggest challenge to this one would matching the funky font. As expected I could not find a match. I decided to seek out something that might be used on the title screen of a 1970's blaxploitation movie. I think I funked it up pretty good with my choice. Bryant Junior High closed permanently in the late '70s. I looked but I couldn't find a mention of the school colors or mascot anywhere. I chose to go with the color scheme used for the Los Angeles Lakers team cards because the background was purple and Prince is pretty much synonymous with the color purple. 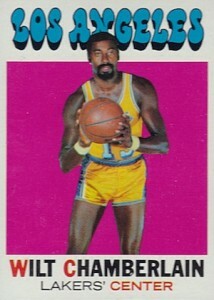 It's also cool that there's the tie-in of the Lakers having moved from Minneapolis in 1960. In the spirit of a Topps style fun fact that were often found on the backs of cards ... Minnesota is known as the "Land of 10,000 Lakes" hence the nickname Lakers. It's curious that Los Angeles chose to keep the name seeing as there are no naturally occurring lakes in the city of Los Angeles. Now you know. The card marks the second card that I've made posthumously of the card's subject, therefore giving me zero chance of an autograph, the first being Tupac.